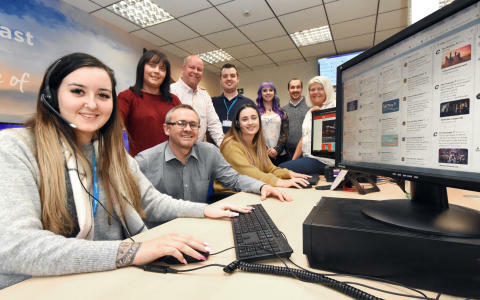 The region’s biggest bus company, Go North East is continuing with its winning ways as its customer service team celebrates securing two finalist spots in the North East Contact Centre Awards. A first in an industry that typically calls-in third party resource, the 12-strong in-house team is one of four in the running for the Dream Team of the Year accolade, after being selected by judges from almost 30 entries. Hot-on-the-heels of success at the 2018 Edge Awards, wherecustomer service advisor, Sarah Cooper won the Customer Service Apprentice of the Year title, the rising star is now up for Multi-Channel Advisor of the Year at next month’s annual event. Since joining Go North East as one of the company’s first team members to embark on its bespoke customer service apprenticeship in 2017, Sarah has excelled in her role. Now progressing onto level 3, the 24-year-old is joined by Zoe Gibbons, who has also accepted a permanent position on the team after completing the training. Based at Go North East’s Bensham office, the dedicated team is integral in upholding the company vision of ‘Journeys taken care of’. Providing direct open and honest communication with its customers 363 days-a-year seven-days-a-week, on average the team manages 2,500 calls per week. In addition, around 700 live web chats and enquiries from 105,000 Facebook and Twitter followers are handled online. Winners of the North East Contact Centre Awards will be announced on 8 February 2019 at a special event at Ramside Hall Hotel, in Durham.